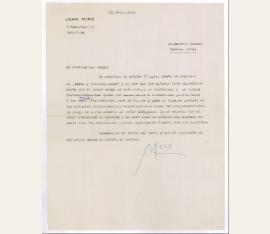 "Earning international acclaim, Miró’s work has been interpreted as Surrealism, a sandbox for the subconscious mind, a re-creation of the childlike, and a manifestation of Catalan pride. In numerous interviews dating from the 1930s onwards, Miró expressed contempt for conventional painting methods as a way of supporting bourgeois society, and famously declared an ""assassination of painting"" in favour of upsetting the visual elements of established painting. Miró has been a significant influence on late 20th-century art, in particular the American abstract expressionist artists such as Motherwell, Calder, Gorky, Pollock, Matta and Rothko." Spanish-Catalan painter, sculptor, and ceramicist (1893-1983). 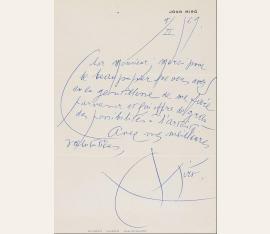 Autograph letter signed ("Miró"). New York. 4to. 1/2 page. Spanish. To Richard de Rochemont (“My distinguished friend“). Miro is asking that he phone him at his number in New York. - For part of his first visit to the United States in 1947, Miró stayed in Rochemont's home, painting his work "Personnages" during the same year and dedicating it to Rochemont. Spanish-Catalan painter, sculptor, and ceramicist (1893-1983). Autograph letter signed. [Tarragona]. Large 4to. 1 p. With autograph envelope. To Leonard Lyons in New York, thanking for some newspaper he had sent him, and hoping to meet soon: „Querido amigo, [illegible] como yo hablamos con mucha frecuencia de U[ste]des y les recordamos con gran cariño, deseando volver a América para verla. Hoy hemos estado muy contentos de recibir noticias de U[ste]des, y le doy las gracias par los periódicos que ha tenido la amabilidad de mandarme. Los dos las mandamos, a su esposa y a U. nuestros más cariñosos saludos [...]“. Spanish-Catalan painter, sculptor, and ceramicist (1893-1983). Autograph letter signed. Palma de Mallorca. Large 4to. 1 p.
Letter to New York Post columnist Leonard Lyons, renowned for his syndicated column „The Lyons Den“. 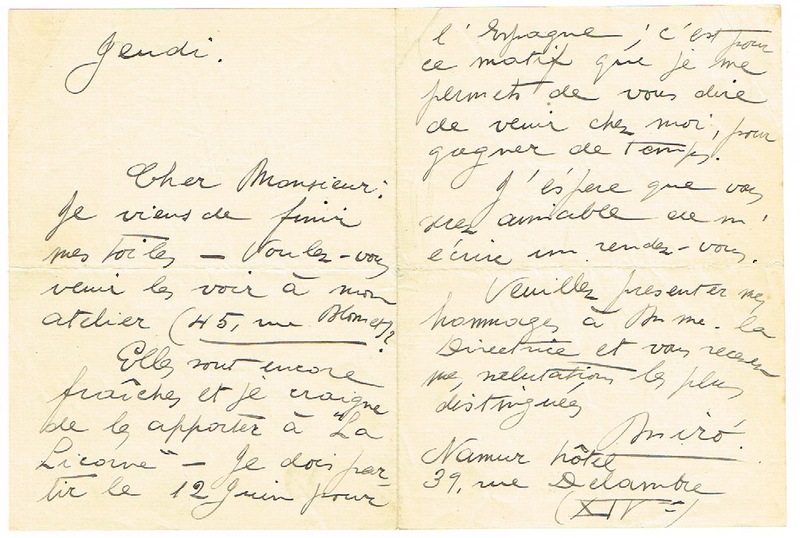 In part (translated): „I am very grateful for the photos that you have been kind enough to send to me. Both my wife and I are reminded of going out with you, and how well you guided us through the lively and interesting New York”. - In fine condition. 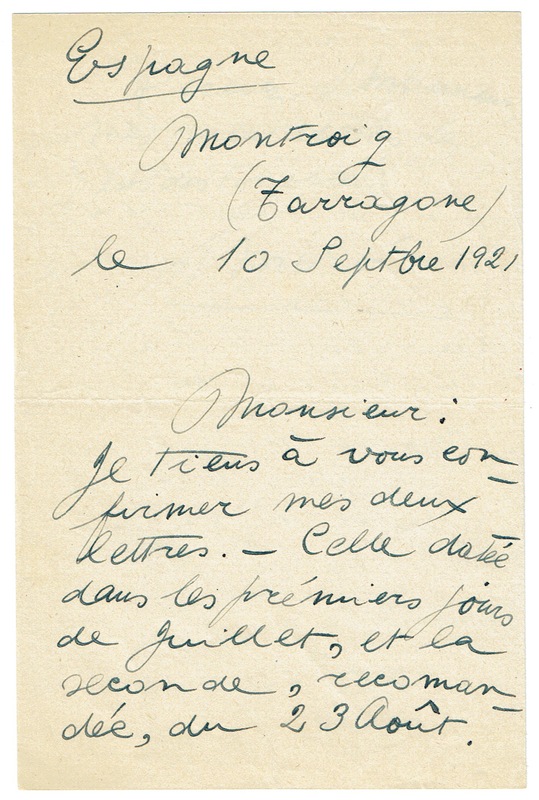 Accompanied by a mailing envelope from a later letter to Lyons addressed in Miro’s hand. Spanish-Catalan painter, sculptor, and ceramicist (1893-1983). 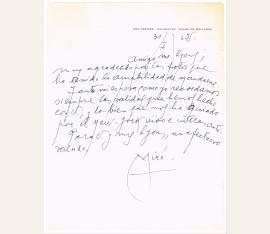 Autograph letter signed „Miro“. Barcelona. 4to. 1 1/2 pages. To to the Belgian painter Alice Frey, thanking her for the invitation to her exposition, but declining to come because of the “changed world”. 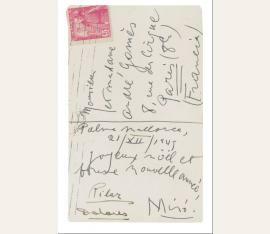 Mirò further tells her about his little daughter and her drawings and about his own work which progresses well at the moment: “C’est très gentil de votre part de m’avoir envoyé une carte pour votre exposition. Avez-vous eu du succès ? C’est ce que je vous souhaite sincèrement. J’aimerais beaucoup voir ce que vous faites maintenant, hélas je ne compte pas retourner à Belgique pour le moment, le monde a bien changé ! Si vous avez quelque photo de trop ou quelque revue qui en publie, pourriez-vous me le faire parvenir, pour me rendre une idée de ce que vous faites en l’actualité. Je suppose que vous êtes toujours en avance, ayant du courage, surtout en ces moments, ou il faut à tout prix se tenir debout […]. Je suis très heureux avec ma femme et ma petite fille qui a d´jà deux ans et demi et qui commence à griffonner de fort beaux dessins, il faut que vous veniez nous voir, nous en seront très contents. Quant à mon travail, je produis ferme, avec foi et fais très souvent des escapades à Paris. Cela va sans dire que c’est là mon point d’attaque, l’Espagne ne compte guère pour moi et je reste ici rien que pour travailler. Le prochain numéro de « cahiers d’art » publiera maintes reproductions de mes œuvres les plus récentes, j’aimerais beaucoup que vous les voyiez. […]”. Spanish-Catalan painter, sculptor, and ceramicist (1893-1983). 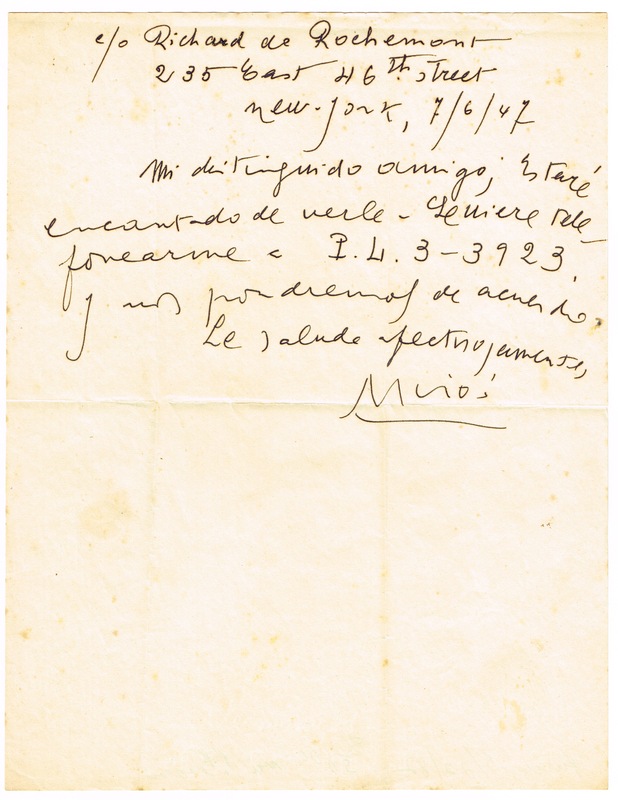 Autograph Letter Signed ("Miró"). [Barcelona]. 4to. 1 page. 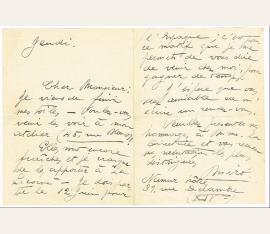 On personal stationery, with original autograph transmittal envelope. 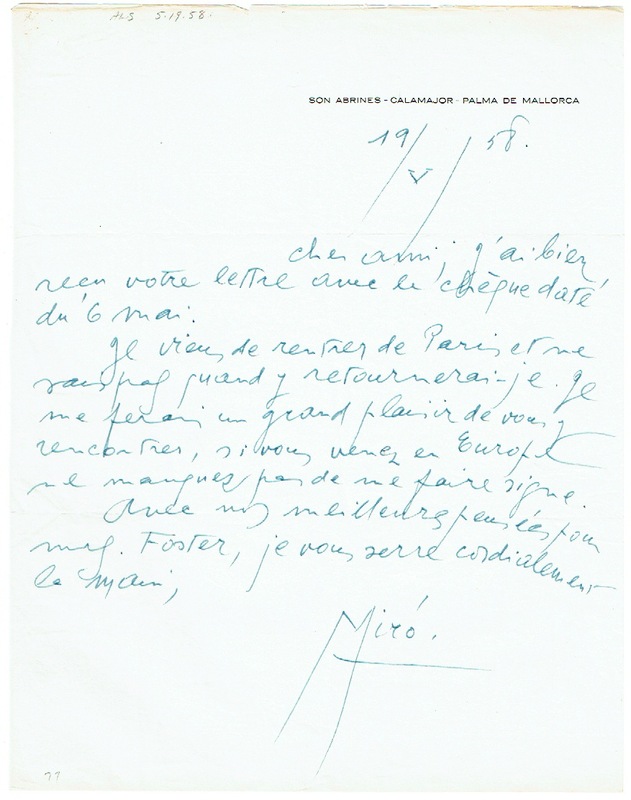 To Joseph Foster, a warm and boldly penned letter in which Miró invites Foster to see him when he is next in Europe. The recipient is likely the same Joseph Foster of New York who was making films about modern artists at this period. Spanish-Catalan painter, sculptor, and ceramicist (1893-1983). Autograph letter signed. Espagne, Montroig, tarragone. 8vo. 2 1/2 pp. 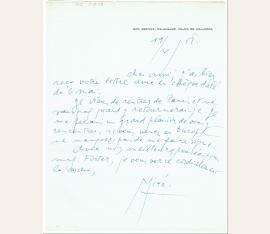 Miró is complaining not to have received an answer on his last two letters and is asking for payment of 750 Fr. for two paintings „Gant“ and „Journal“. Payment should be made to his agent Peres Gorba. Spanish-Catalan painter, sculptor, and ceramicist (1893-1983). 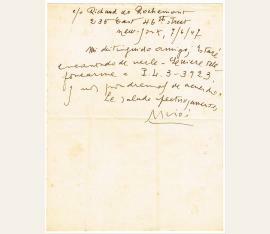 Autograph Letter Signed ("Miró"). [Paris]. 8vo. 2 pp. To one unnamed doctor, announcing that he has just finished his paintings and invites him to come and see them in his new workshop: „Je viens de finir mes toiles. Voulez vous venir les voir à mon atelier (45 rue Blomet). Elles sont encore fraîches et je craigne de les apporter à la Licorne. Je dois partir le 12 juin pour l’Espagne; c’est pour ce motif que je me permet de vous dire de venir chez moi, pour gagner du temps. […]“. Maler und Graphiker (1893-1983). 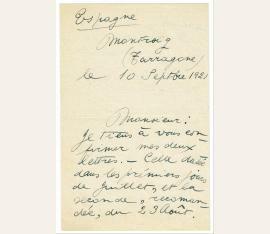 Autograph postcard signed ("Miró"). Palma de Mallorca. 1 S. (Qu.-)8vo. Mit eh. Adresse. Mit einer Beilage (s. u.). 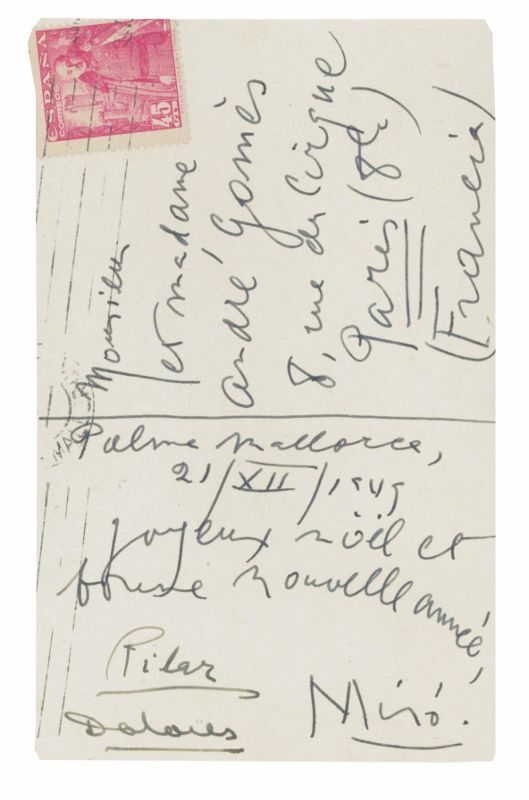 Christmas wishes to André und Henriette Gomès; also signed by his wife Pilar and his daughter Dolores. - Includes a clip of an envelope with autogr. return address. Maler und Graphiker (1893-1983). Autograph Note Signed. Palma de Mallorca. Oblong large 8vo. 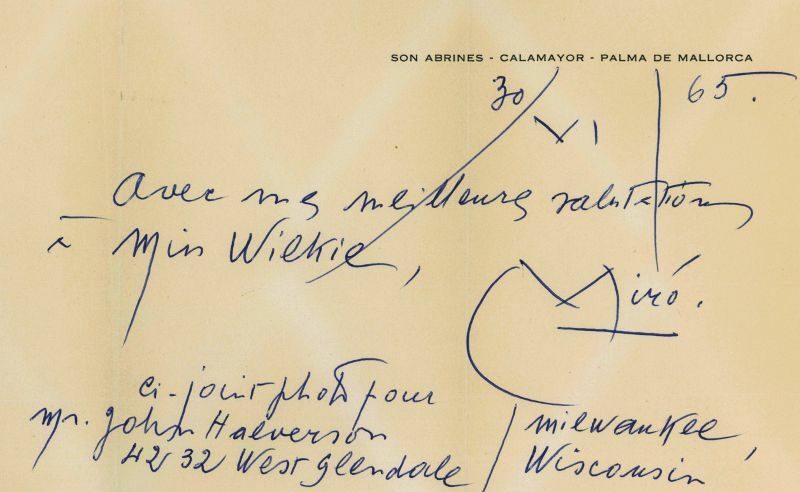 1 p.
"Avec mes meilleure salutation á Miss Wilkie, | Miro". 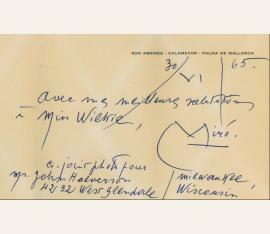 - Miro also included a "photo pour Mr. John Halverson [...] Milwaukee, Wisconsin". - From the Estate of Charles Williamson and Tucker Fleming. 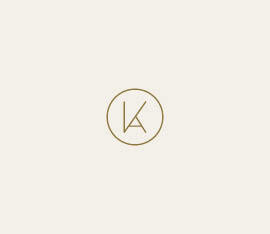 - On personal stationery; without the photo. Spanish-Catalan painter, sculptor, and ceramicist (1893-1983). Typed letter signed. Barcelona. 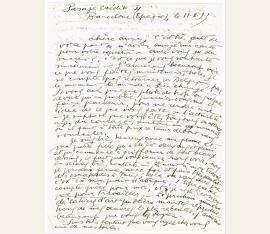 Half page, on quarto lettersheet of personal letterhead. With one correction and several insertions of accents in ink. Folded for mailing, else about fine. To "Mi distinguido Amigo," (Gallery principal Marcelo de Ridder in Buenos Aires). 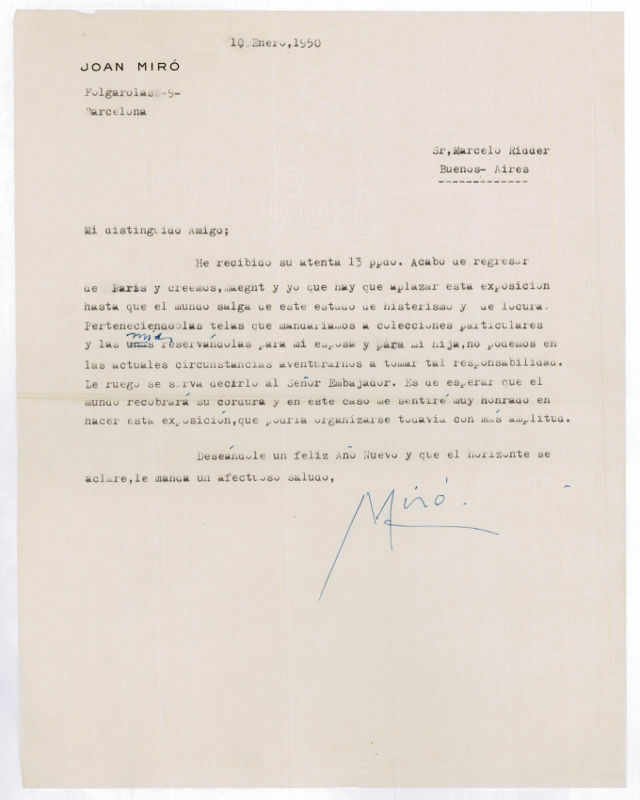 In part, Miro writes [in translation]: "[...] I just returned from Paris; Maeght and I think this exhibit should be postponed until the world comes out of this state of hysteria and madness. Since the paintings that we would send belong to private collections, and mine are being kept for my wife and daughter, we can not risk assuming such responsibility under current circumstances. Please pass this information on to the Ambassador. I can only hope that the world will come back to its senses, and in that case, I would be very honored to do this exhibit, which, by the way, needs to be better organized [...]" (transl.). Signed boldly "Miro"..
Peintre, sculpteur et céramiste espagnol (1893-1983). 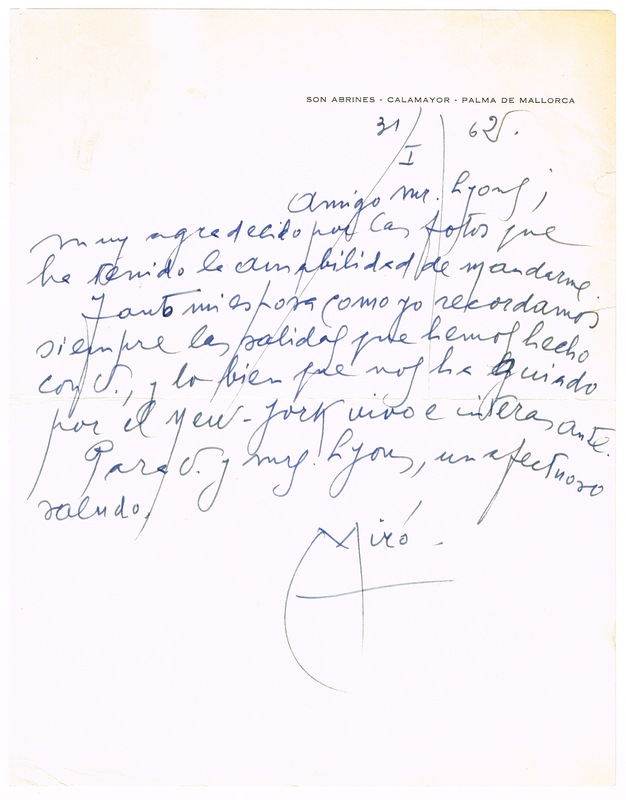 Autograph letter signed ("Miró"). New York. 4to. 1 page. With autogr. envelope. To Nelson Fuqua: "Mon cher ami, Je suis profondément touché pour toutes les démarches que vous avez faites pour nous à Chicago. J'ai été tellement bouleversé par ce séjour en Amérique et débordé par tout, que vous avons fais le projet de rester à New York cette fois-ci et de revenir l'hiver prochain pour voyager. A ce moment nous viendrons à Chicago ma femme et moi. Nous espérons avoir le plaisir de vous rencontrer à Paris au début juin. Merci encore de tout cœur; Avec tout ma plus sincère amitié [...]". - On headed paper of Gladstone, New York. Joan Miró (1893-1983), Spanish Catalan painter, sculptor, and ceramicist. Autograph letter signed. Barcelona, April 22, 1945. 2 SS. Small 8°. 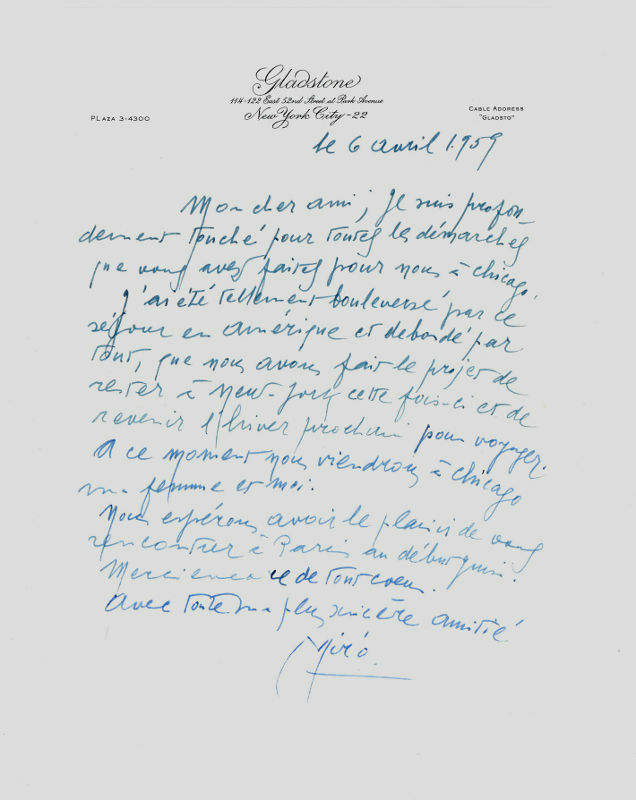 – To „docteur Laugier“ on travelling and a planned exhibition: „[…] comme je vous le disais, je me tiens entièrement à votre disposition pour organiser une exposition de mes oeuvres à Paris, et je tiens également à vous dire comme je me sens honoré par votre proposition. Je vous disais aussi que j'ai beaucoup de matériel pour la faire [...]“. 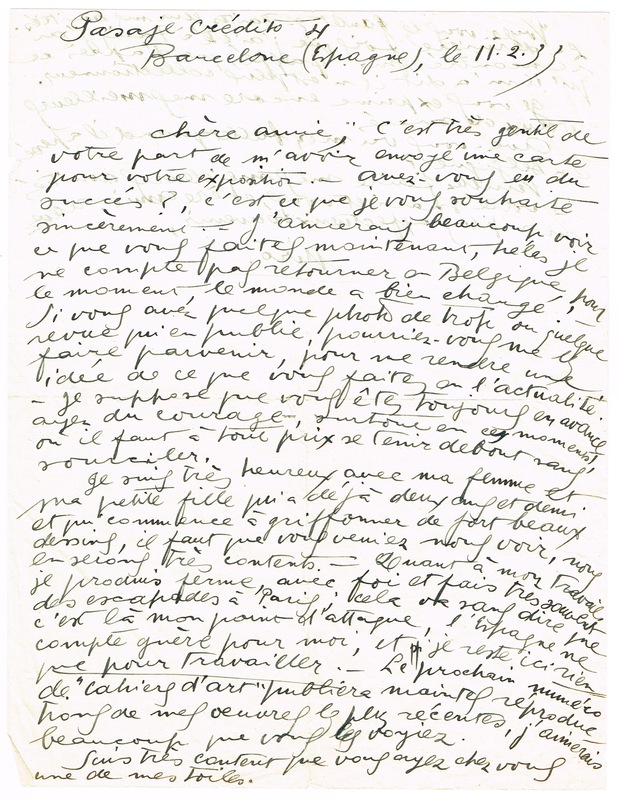 – Upper right margin slightly torn (scarcely loss of letters), p. 1 slightly ruststained. 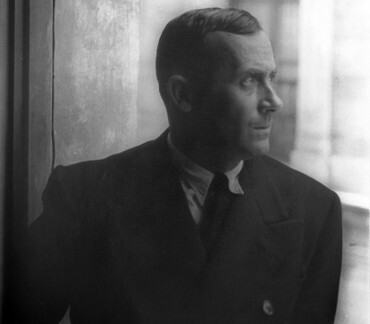 Joan Miró (1893-1983), Spanish Catalan painter, sculptor, and ceramicist. 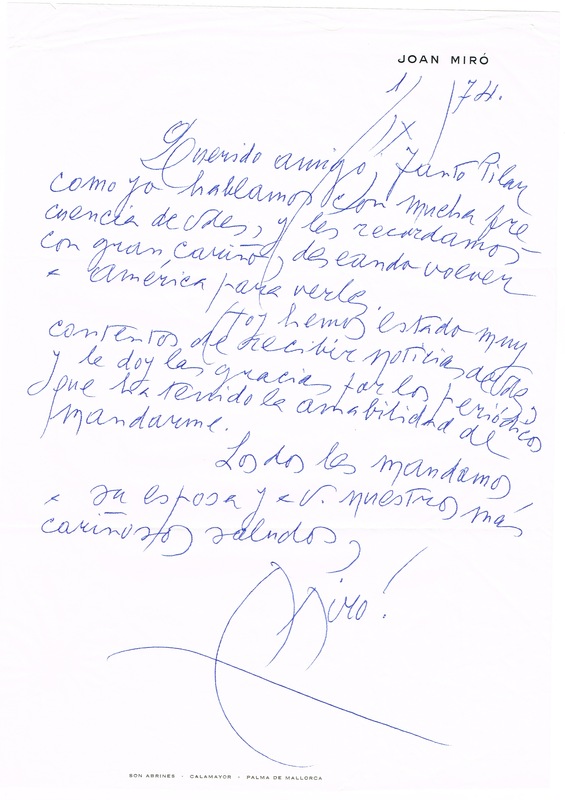 Autograph letter signed („Miró“). Palma de Mallorca, February 9, 1969. 1 p. 4°. 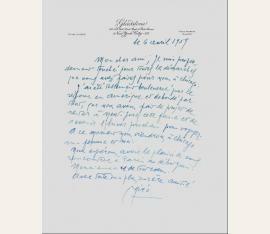 – Graphically designed letter of thanks: „[...] Merci pour le beau papier que vous avez eu la gentillesse de me faire parvenir et qui offre de grandes possibilités à l'artiste [...]“. 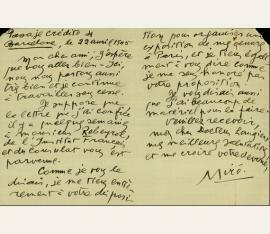 – Date and some initials with distinctive descenders, Miró’s signature in his typical graphic design (head with a hat).